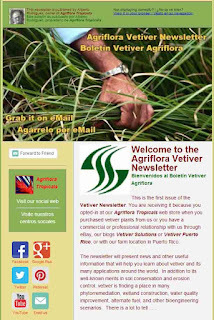 After putting it off for an incredible long time, the first issue of the Agriflora Vetiver Newsletter went out last Friday, March 8 to the first group of email subscribers. Even if it does not become a collector's issue, the newsletter will present news and other useful information that will help you learn about vetiver and its many applications around the world. In addition to its well-known merits in soil conservation and erosion control, vetiver is finding a place in phytorremediation, wetland construction, water quality improvement, alternate fuel, and other bioengineering scenarios. 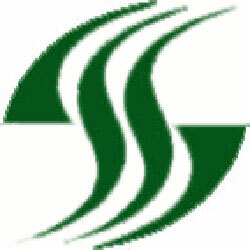 As reader of this blog, you have the option of receiving a copy of the blog it via email so you do not miss any posts, subscribing to the new newsletter - or both. Check the column on the right for both subscription options. If you want to opt-in to the newsletter right now, click on the Agriflora Vetiver Newsletter Signup Form and fill out a few details. If you missed the first issue or any others, you can still get your copy from the Archive. I hope that you enjoy reading it, and I promise not to share your information or use it for any other purpose.